The first official class at the new the newly renovated UPMC East WISER Center was conducted on Thursday, 12/15/13. The newly renovated center is located in the Demarco Building, right next to UPMC East in Monroeville, PA. The Demarco Building houses the Clinical and Nursing Education departments and UPMC East Support Services. In addition to the WISER Center, the education center houses state of the art classrooms and computer labs, as well as office space for the education staff. 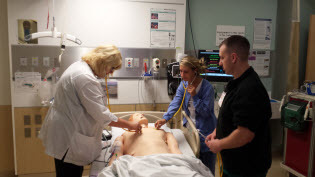 The simulation room at the center is an exact replica of a patient room at UPMC East, and was used as a test room for placement of equipment during the planning and construction phases of the hospital. The center provides a familiar environment for the continuing education of current UPMC East staff, and an ideal place for the orientation and training of new staff. Over the next few weeks and months, the Education and WISER staffs will work together to complete instructor training on the new equipment and increase the number and variety of courses available at the center. Once the programs have begun, the UPMC East WISER Center will play a crucial role in the continuing education of the UPMC East staff, and help improve patient safety throughout the UPMC Health System.